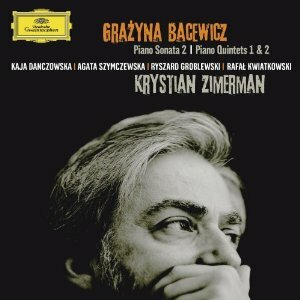 We owe Krystian Zimerman a debt of gratitude for putting the weight of his celebrity behind the work of the under-appreciated Grażyna Bacewicz, and getting this top quality album of her works into the DG catalogue. By all reports it has been a struggle. The recordings were made on the back of a tour of Poland to mark the composer's centenary in 2009. But Zimerman also wanted to include a recording of Bacewicz herself performing one of her violin works (she was a virtuoso player). Negotiations with Polish radio for the rights to the recording have been going on for the intervening two years, but have come to nothing. Nevertheless, listeners are unlikely to come away from this recording feeling short-changed. Bacewicz was active in almost every genre, but considered her chamber works to contain her greatest music. Certainly, the piano quintets and sonata presented here are music of the highest quality. The two quintets are also indicative of the two stylistic periods of her career. She had studied in Paris in the 1930s, and the disciplined neoclassicism she encountered there put her in good stead with the Communist authorities in Poland. But then in the late 1950s, everything opened up in terms of the stylistic constraints on Polish composers, and Bacewicz followed the lead of the younger generation in exploring tone colour and musical textures rather than traditional tonal argument in the construction of her music. The two quintets date from 1952 and 1965 respectively, so give a taste of both styles. Calling Bacewicz's 1st Quintet neoclassical is to do it a disservice though. Certainly, the structuring is based on a classical sense of proportion and an underlying tonality can usually be perceived, but in every other respect this music is very adventurous indeed. Much of it is quiet and slow, with the phase structuring only implicitly defined. But it also regularly builds up to dense climaxes. The composer's innate knowledge of the instruments' capabilities allows her to created dense sounding textures without compromising the linear focus of each of the parts. It's well constructed music, but that craftsmanship never impedes its sheer expressive power. The 1st Quintet suggests parallels with Prokofiev, parallels that become even clearer in the 2nd Piano Sonata. Again, there is plenty of discipline and fine crafting here, but the overriding impression is of music with a broad emotional sweep. Long phrases range across the keyboard, seemingly simple melodies begin, but are then forced into sophistication by the complexity of the accompanying figures that accrue beneath. She comes across here as a sort of Expressionist Chopin. The 2nd Piano Quintet is more of a puzzle. It is clearly influenced by the sonoristic innovations of Lutosławski and Penderecki, but the music remains essentially linear, and its structure retains at least vestiges of the classical forms of her earlier work. The harmonies are inscrutable, but never ugly. The reduced role of tonality means that the larger chords are not as iridescent as before, imparting a sense of introspection, which may or may not be deliberate. One certainty though is that this music does not play itself and requires committed interpretation. Krystian Zimerman and his colleagues give it everything and the results are magnificent. Zimerman gives a reading of the sonata that is as passionate as it is precise. He is a player who knows all about making the most of the moment, so when Bacewicz calls for a phrase to appear out of nowhere and take the audience by surprise, Zimerman gives the effect all the immediacy and physical power it needs. He doesn't hog the limelight in the quintets, which benefit from excellent balance between the instruments. Excellent sound quality all round actually, and well presented packaging, with a liner essay that tells us something about the player's relationship with the music rather than just the standard composer bio. Highly recommended.